Correct Dosage 1 cap (50ml) = medium & hard water. 1 + 2/3 cap (83ml) = very hard water. 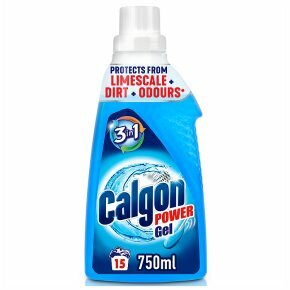 Use in Every Wash. Add Calgon on top of your normal detergent in the main wash compartment. Dose the quantity of laundry detergent recommended for soft water. Suitable with all types of fabric. CALGON Power Gel. Keep away from eyes. If product reaches eyes, rinse with plenty of water. Avoid ingesting product. If swallowed, then seek medical advice.